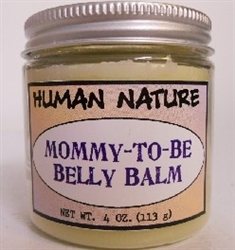 We created our all natural belly balm to prevent stretch marks, improve elasticity, soothe & moisturize the bellies (and any other expanding areas that need extra attention) of pregnant mommies. Simply rub on areas that need attention 2 times a day or as needed. We recently reformulated the belly balm by adding Argan Oil & Murumuru Butter (see more on these ingredients below)! Contains: Theobroma Cacao (Cocoa) Seed Butter, Olea Europaea (Olive) Fruit Oil, Butyrospermum Parkii (Shea Butter), Beeswax, Cannabis Sativa (Hemp) Seed Oil, Simmondsia Chinensis (Jojoba) Seed Oil, Hydrogenated Persea Gratissima (Avocado) Seed Oil, Prunus Amygdalus Dulcis (Sweet Almond) Oil, Astrocaryum Murumuru Butter, Argania spinosa (Argan) Oil, Royal Jelly Extract, Lavandula hybrida grosso (Lavender) Oil, Citrus aurantium (Petitgrain) Oil, Litsea cubeba (Litsea) Oil, Tocopherol. Available in 2 or 4 oz. plastic jars or 1/2 oz tin.